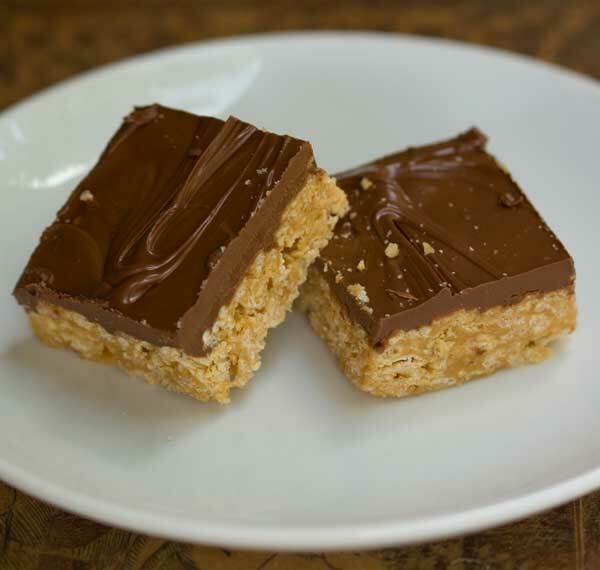 Scotcheroos made with Special K. You can also make them with the traditional Rice Krispies. Line a 13x9 inch pan with nonstick foil. For a half batch, use an 8 inch pan. a large (3 quart) nonstick saucepan, combine sugar and corn syrup and heat just until mixture begins to boil and sugar starts to dissolve. Remove from heat and stir in peanut butter and vanilla. Stir until well blended, then stir in the cereal. Empty the mixture into the pan and press firmly. You may want to lay a piece of parchment or nonstick foil over the top to do this.